Announcement Just sold most of my inventory at a show. Please bare with me as I construct more beautiful outdoor birdhouses. Welcome to Birdhouses by Michele where I create handmade bird houses for the comfort of birds who need a place to nest and raise there young. Birds who love my houses are the chickadee, titmouse, wren, blue birds, house sparrows, house finch, violet green swallow, woodpecker, screech owls and I am sure there are a few more I didn't mention. 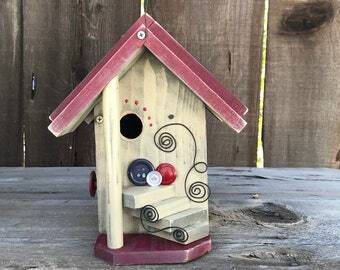 Find handmade Bird Houses that are whimsical, rustic, made for the outdoors. Handcrafted Birdhouses with functional clean-out doors made with quality materials. Each Bird House has been decorated with unique accents of many different elements. Most all of my Bird Houses hang easily with a convenient thick wire, securely attached to the front and back of the birdhouse's roof. I build post mount Condo Birdhouses, as well as Bird Houses to place on a shelf. All are made for the outdoors. 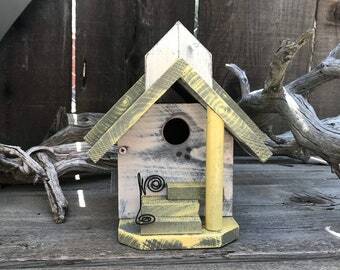 If there's a birdhouse in my sold that you LOVE, I can make it (with exception of driftwood houses) or as close as possible and in the colors you like. Just ask and I will make you a reserved listing. I am thrilled you stopped by. Did you check out my reviews? There are so many happy customers that love my birdhouses. I've been told my bird houses are unique and one-of-a-kind. I like that. Makes me do the happy dance. Please do understand that my costs are my valued time and making sure my product is of sound craftsmanship. I pride myself in making the best. This is my full time job and how I pay my bills. It is a craft I've mastered and do my best to keep the cost down, but I do need to make a wage and lumber seems to keep going up in price, along with lumber taxes (I'm in CA). All are handcrafted, by me, Michele, in the USA in my little wood shop with many power saws and hand tools. Watch my process on how I create my one-of-a-kind birdhouses. 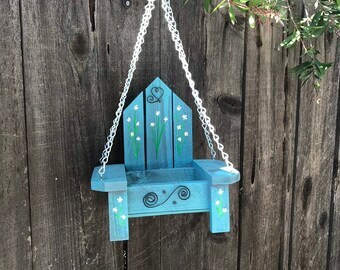 Click this link: https://www.etsy.com/shop/BirdhousesByMichele#about It's always fun to see how others work and create. Enjoy! Cheers! So...If you ask yourself, why spend this amount? Well... I feel it's worth it, on the quality, the time it takes to build and the effort I've made to ensure my product is sturdy, well made and all the attention to the details on adornments and such. I'm an accomplished, published, Author of Handmade Birdhouses and Feeders, Handmade Bird, Bee, and Bat Houses, published by CICO Books, Ryland, Peters & Small. Many of my birdhouses have been featured in Birds & Blooms, Long Leaf Style Magazine, Handmade Living Magazine and Bises Magazine (Japan). *****Thank you for taking the time to stop in and reading notes, policies and descriptions. *****Upgraded shipping is available for next day at an extra charge (see chart on drop down menu). I ship out each day Mon. thru Sat. (Post Office closed on Sunday). Just sold most of my inventory at a show. Please bare with me as I construct more beautiful outdoor birdhouses. I absolutely love my new birdhouse. Very nicely built can’t wait for the birds to find it. Great transaction! Beautiful and great quality! The birdhouse is a really nice addition to our yard - no birds making it their home yet, but I am hopeful - maybe next year! Thank You Very Much! Super adorable and my daughter loves it. Our feathered friends are going to love this! Ready to ship same day. ~ Watch my video on the about page where you can see that I make all my creations myself. I've had so many people ask me if I get the bird boxes from China and then embellish them. Nope. All my woodworking is done with my own two hands and all the designs as well. ~ I've been blessed with a book company, CICO Books, Ryland, Peters & Small, London and New York, that asked me to create a how to book on building birdhouses. Now I have two books under my belt and feel very proud that I'm a published Author and have accomplished many things in my life. ~ I've discovered how much fun it is to watch birds, studying their habits and learning what certain garden birds like in birdhouses. Building birdhouses for cavity nesting birds not only satisfies my creativity, it helps birds find safe places to raise their young. ~There's never a dull moment in my adventures of finding new things to embellish or construct my birdhouses with. My walks with my lady friends always turns out to be each of us carrying some kind of object back home that will be a part of one creation or another. I love them for that...supper supportive. ~ Designing, engineering and constructing well built birdhouses for birds since 2008 with accomplishments of a ‘How To Books’ Handmade Birdhouses and Feeders, Handmade Bird, Bee and Bat Houses, Published by Cico Books, which is in several languages. You can find my books world wide and in several different languages. ~I've been featured in three magazines such as Birds & Blooms, Handmade Living, Long Leaf Style, Bises Magazine of Japan and now Roger's Gardens of Newport Beach. I feel truly blessed with all and hope to be in more. 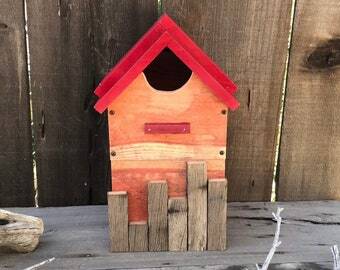 ~ Wood birdhouses are made from raw untreated fence material which makes it easier on the birds by allowing the roughness of the interior for birds to grab, along with a dowel that protrudes through for extra grabbing power. 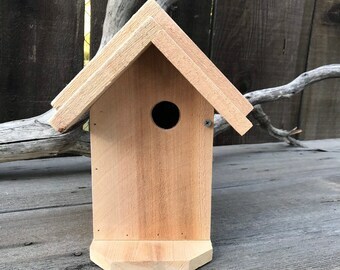 Each birdhouse I build has a unique roof design, by me, which allows for ventilation air flow on each underside of eaves. Every decorative bird house or functional birdhouse is equipped with a clean out door on either the right or left hand side for nest removal. Whether you choose to use it indoors for decorative home accent or hang it on your patio, tree, fence or just sitting on a shelf, it's meant for small cavity nesting birds. Birdhouse accent materials are adhered with clear silicone that is weatherproof and freeze proof for that extra longevity outdoors. I use quality glue, nails and decorative screws to hold my birdhouses together. ~All birdhouses are constructed by me with consideration of the bird’s wants, needs and functionality. Each bird house is equipped with a clean out door for proper nest removal, either on right or left side, as well as the roof. Most of my bird houses hang from heavy wire attached to the roof edge, which you can easily hang from decorative iron planter stands, tree limbs and open eye hooks. 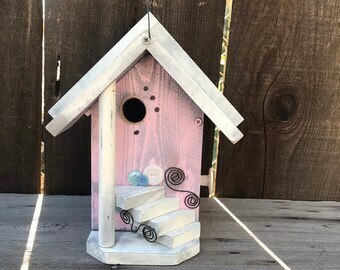 ~Handcrafted functional birdhouses for birds nesting needs or to use as home decor. I create them with pride and do my best to use quality materials to ensure they will last. Weather will do its part on the birdhouse of course, but if you varnish each year with Marine Varnish you will enjoy these handmade birdhouses for years to come. ~Creating bird feeders with different designs that will give many hours of enjoyment in watching birds gather in your garden. Feeding is a great way to earn birds trust in order to study which species visit your garden spot. ~Got bats? I build bat houses too! Bats eat 1000 mosquitoes and hour! That pretty impressive and it's a good idea to encourage these winged mammals to take refuge by providing a house they can sleep in during the day and get those pesky bugs at night. I've got many projects in my head to start creating. But, the one I love most...is building birdhouses for birds to thrive. I love nature, that's why I build bee, bug, butterfly and bat houses. All from scratch. Just watch my video and you'll see. Sylvester keeps an eye out for the birds and keeps Michele's lap warm at night. Birds renting the birdhouses on the property, making sure they're up to snuff. Please read all notes and descriptions in each listing. If you are not satisfied with your purchase you may return your purchase with the understanding that you are responsible for the shipping charges. NOTE: All sales are final with purchases are made with any kind of a coupon, no exceptions. Shipping charges incurred are not refundable. There will be a 20% re-stocking fee on each returned item. DAMAGED - If your item has arrived damaged, no worries, they are always insured and a prompt refund will follow once insurance claim has been filed and all documents have been submitted. Please read return policies. Custom/Special Orders are NOT refundable, unless an agreement has been made between both the consumer and owner. REFUNDS: Shipping charges will apply. All sales are final when coupons are used for purchases, no exceptions. You are responsible for shipping charges for returned items, along with insurance. If item to be returned is not insured and damage occurs, refunds will be declined. NO REFUNDS on special orders period, unfinished birdhouses - UNLESS AGREED UPON BETWEEN BUYER AND SELLER. DAMAGED IN SHIPPING: Unfortunately circumstances beyond my control will arise where a product may get damaged through shipping. If your product arrives damaged, please contact USPS immediately to let them know your package was improperly handled. This will guarantee a prompt refund or exchange. Please keep original box with shipping label, all packing material in case item needs to be returned. Once the Post Office has viewed your contents there will be a claim made. 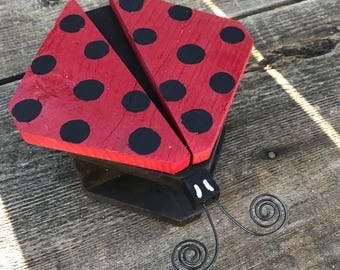 PLEASE CONTACT Michele's Birdhouses ASAP through ETSY to let her know the product arrived damaged. Send a photo of box, packing material and damaged product. All my products ship with insurance for these unfortunate mishaps and need to be recorded in order for reimbursement. Payment is due upon purchase, as well as with special orders. All major credit cards Visa, MasterCard, American Express & Discover are accepted you may also go through Direct Checkout with ETSY. It's easy, fast and safe through etsy to make a purchase. Sales tax will be added where applicable. Please, if you have any questions or concerns you may contact me (Michele) at any time. I try to respond ASAP through what ever device I have with me for your inquiries or concerns. USPS (United States Postal Services) ground shipping on all products unless next day air, FedEx, UPS, are needed where extra charges will apply. Physical addresses only as USPS will not deliver to P.O. Box's. INTERNATIONAL SHIPPING avaialble! Please contact me via Etsy for prices. PLEASE NOTE THAT IF THERE ARE SHIPPING OVERAGES A REFUND WILL APPLY ONCE ORDER HAS BEEN PACKED AND SHIPPED (This will allow the shipping costs to be calculated). Birdhouses, along with the box, packing material, become heavy and bring the shipping charge to an expense I've become aware that I can't afford to pay the difference. If the shipping is less, I will refund the difference ASAP. Please understand it's out of my hands and shipping large heavy items end up in a different shipping category. You may also ask me via ETSY how much it will cost to your exact address and zip. PLEASE NOTE: IF ITEM NEEDS TO BE RETURNED CUSTOMER IS RESPONSIBLE FOR SHIPPING CHARGES AND INSURANCE. ALL SALES FINAL ON PURCHASES WITH COUPONS OR SALE. SHIPPING COST WILL BE AT BUYERS EXPENSE IN ORDER TO RETURN PRODUCT TO SELLER. NO REFUNDS - UNLESS AGREEMENT HAS BEEN MADE BETWEEN BUYER AND SELLER. IF BUYER HAS NOT PURCHASED INSURANCE AND ITEM COMES BACK DAMAGED, ALL REFUNDS WILL BE DECLINED. It is your responsibility to purchase insurance on returned items. My products are insured through USPS or FedEx. Custom orders should be paid up front before delivery and refunds or exchanges are not recommended, but can be resolved by contacting Michele through ETSY convo. 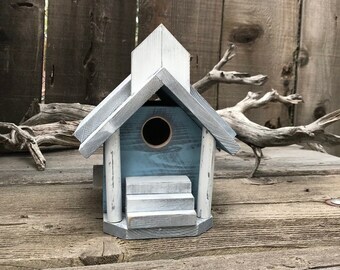 I will do everything possible to create the perfect birdhouse or gift item your asking for through photographs of progressive work on your special project ordered.